On a fine spring day in the Czech capital, a young busker draws a crowd with his rendition of "Knockin' on Heaven's Door". Little does he realize the poignancy of the Bob Dylan lyrics. Since the pedestrian zone where he's standing was built in 1985 in the heart of Prague, thousands of people unknowingly walk daily across a pavement made of tombstones taken from a derelict Jewish cemetery. "Some things are always shocking, regardless of your faith," says Leo Pavlat, head of the Jewish Museum in Prague. "Does this barbarian act offend only Jews, or is it a matter of culture, decency, shared citizenship?" Pavlat told AFP that he had kept two of the paving stones, which he had taken off a pile at the time of the pavement's construction, as a "sad reminder". "They had an inscription in Hebrew," he added. Since the 1989 fall of Communism, Jewish representatives have taken up the issue of the paving stones -- and the upset they cause -- with authorities several times. "We talked about it with several interior ministers and mayors of Prague. "They were sympathetic but things became complicated lower down, when civil servants raised different obstacles of a technical and organisational nature," said Tomas Kraus, secretary of the Czech Federation of Jewish Communities, which has about 3,000 members. With great pomp, Czechoslovakia's totalitarian regime opened the pedestrian area in November 1985. For decades the Jewish paving stones' fate has upset some residents, without ever becoming the subject of a wider public debate. "I didn't know (the paving was formerly Jewish tombstones), and to tell the truth, it's all the same to me. I have other worries," Karel Cihak, a manager in his 50s, told AFP. "I'm hearing that for the first time too. But that seems scandalous to me. The Jewish community here has a long and rich history, inseparable from that of Prague," he said. "Really? We're walking on tombstones here? 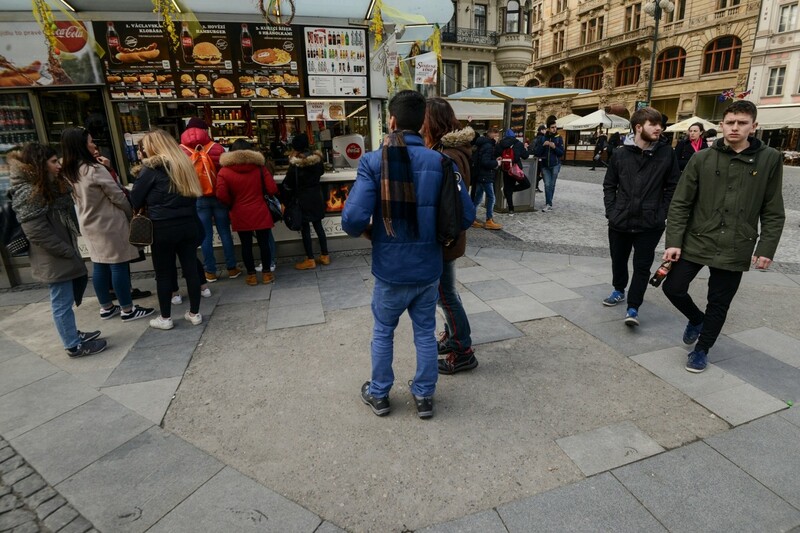 Very strange," says Fabio Marangoni, a young Italian told AFP, munching on a Wenceslas sausage near the paved area. At its unveiling, the Communist daily Rude Pravo called the pedestrian zone "a magnificent work of socialist construction". "This is a symbol adequate to the greatness of our time," then-president and Communist Party chief Gustav Husak said. But he did not mention that the stones came from a neglected Jewish cemetery in the northwestern village of Udlice, nor that they were placed with the Hebrew inscription facedown. "For the Communist regime, Jews were the arch-enemy," said Kraus. "The authorities wanted to get rid of all things Jewish," he told AFP. He attributed this hatred, in part, to Soviet dictator Joseph Stalin's failed dream of seeing modern Israel transformed into a regional island of Communism and ally of the Soviet Union after independence in 1948. "Communist propaganda remained very anti-Semitic and anti-Israel until the regime was toppled," said Kraus. Between the two World Wars, the Jewish population on the territory of today's Czech Republic numbered around 120,000 people, of whom 80,000 died during the Nazi occupation. A recent article in the Dnes daily again raised the Jewish stones issue. "That ought to have been repaired a long time ago," its author, journalist Ondrej Hanko, told AFP. "This paving should be changed out of respect for our ancestors," said the councillor in charge of culture, Jan Wolf, who added he wanted to meet Jewish community representatives soon. "In any case, it's good to talk about it so that people know. It will serve as a reminder," said Kraus.